Signs of You was fun, but what I loved most about it was how it highlighted the importance of forgiveness and friendship. Four friends, connected with each other because they each lost someone very close to them. One of their fathers (who is dead), a professor, found a long lost relic. When they each touched it, they started seeing the one person that they had lost. The perfect blend between real-life fiction and a bit of the paranormal to keep the reader guessing. The story was heart felt, with characters who are dealing with the loss of someone they loved deeply, making it easy to connect with them. Emily France has beautifully described all the emotions that go with the loss of a loved one, and she explores just how much someone is willing to go for their one last chance at redemption. She has created characters that are very much human, showing that grief can be blinding. This book kept me engaged with the mystery and had me crying by the end. Ever since Riley Strout lost her mother two years ago, her survival has depended on her other family: the quirky kids she met in a grief support group at school. Jay, Kate, and Noah are the only people who understand her pain; each lost a loved one. When Riley sees her dead mother shopping in a grocery store, she fears post-traumatic stress—until Jay and Kate report similar visions. Noah, having seen nothing, withdraws. Soon he disappears, and Riley fears the worst. But the frantic search for him unexpectedly draws Riley and the other two into a mystery surrounding a centuries-old relic and the clues it might offer about the afterlife. By reaching for the ones who are gone, Riley uncovers hidden truths about those she hasn’t yet lost. "Emily France's debut is an irresistible force of nature. 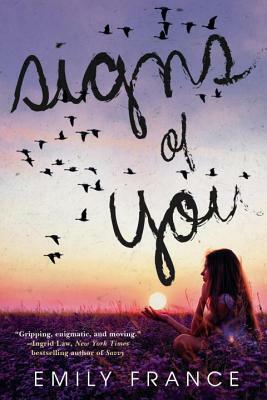 Signs of You felt like it was written just for me, and made me want everyone else to read it immediately. Read this book." "There's a terrific mystical-ghost-mystery here, but we really loved the characters in Signs of You. They're conflicted and wounded, but still passionate about their friendship, uncovering the truth and finding closure. (And there's a sweet, slow-burn romance that'll restart your heart in the best way.)" "A blend of mystery and mysticism . . . Fair warning: your final pages will be tear-stained." "Kudos to France for creating distinct and compelling characters that will keep readers invested in her debut . . . An entertaining mystery cleverly rooted in religious lore. The Sixth Sense meets The Da Vinci Code for teen readers." "This genre-straddling debut novel is a palatable blend of the supernatural, the spiritual, Dan Brown’s The Da Vinci Code, and YA romance ingredients . . . The spiritual and historical elements are well balanced—not an afterthought and not overpowering this very human story of letting go and moving on." "Compelling . . . [France's] characters are sympathetic and believable, and her message about what keeps people moving forward after tragedy resonates deeply." "An inventive concept—part mystery, part supernatural, part spiritual meditation—and the four friends are compassionately drawn, even in their flaws." "The bond between the four teens will resonate with readers, as having a loving, dependable support group is a universal desire . . . The author notes at the end help to separate fact from fiction as well as offer options for further reading on the topic of St. Ignatius. Devastating loss, ghostly apparitions, devoted friendships, and a hint of romance combine to make this debut novel a compelling read. Readers can look forward to whatever else this author has in store." "In Emily France's poignant and powerful first novel, her vividly depicted high school heroine tackles life's highest questions. The novel opens a door to a true spiritual quest. France's achingly relatable teen characters come together in shared grief and help each other make both historic and personal discoveries. France tells this sweeping yet intimate tale with wisdom, humor, and heart." "Emily France’s Signs of You defies stereotypes as it takes on the story of a loss, friendship, and healing."